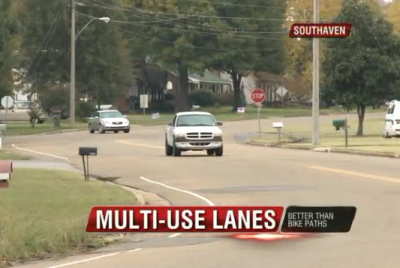 (Southaven, MS) Lots of communities have new bike lanes on lots of streets but Southaven leaders say they’d like to take that idea one step further. That idea, is to introduce not just bike lanes, but “multi-use” lanes, that officials here say residents have asked about for years, ”Over the past ten years that I’ve been here, we’ve had numerous complaints every year from people that say you just can’t get from point A to point B without a vehicle, and it is a problem” said Southaven Planning Director Whitney Choat-Cook. Lots of neighborhoods have sidewalks, but there’s almost no safe path connecting those neighborhoods. Choat-Cook, an avid runner, came up with the idea ”It’s not just one way of transportation or two ways of transportation. I mean you can ride a bike, you can run, you can walk, you can drive an automobile”. So far, initial reaction from aldermen and the public has been encouraging ”I’d like to see the whole city covered. I’d like 42 square miles of multi-use trails but we’ll be starting on existing roadways that are extra wide”. Choat-Cook hopes to get construction started on the trails sometime this coming spring.